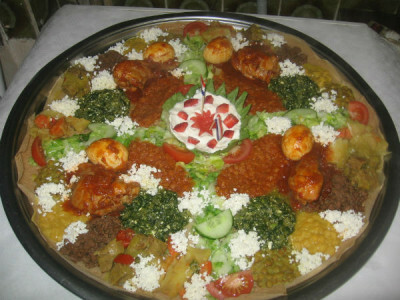 The menu of Ethiopian restaurant Addis Ababa can be found below. Is a dish vegetarian or spicy, then that is indicated by the following icons. If you want a vegan meal, that’s possible. The meat that we use, is halal and comes from an Islamic butcher’s shop. Also if you want to eat gluten-free, that is possible, but let us know that one day in advance. Then we can make gluten-free injeras especially for you. These injeras, that are only made up of teff and not of wheat, cost only € 2.00 per person more, because teff is a lot more expensive than wheat. Read more about our ingredients and allergens. 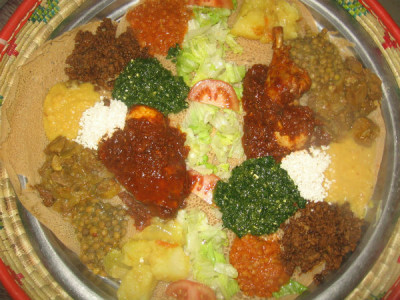 In short: restaurant Addis Ababa is hospitable to fish lovers, meat eaters, vegetarians, vegans and people with food intolerance. Take away is also possible. Melkam megeb! “Enjoy your meal!” in Amharic.